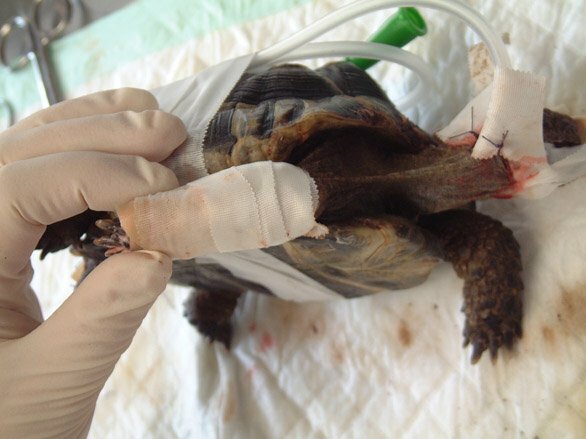 Keywords: spur-thighed tortoise; rat bite injuries; post-hibernation; wound management. 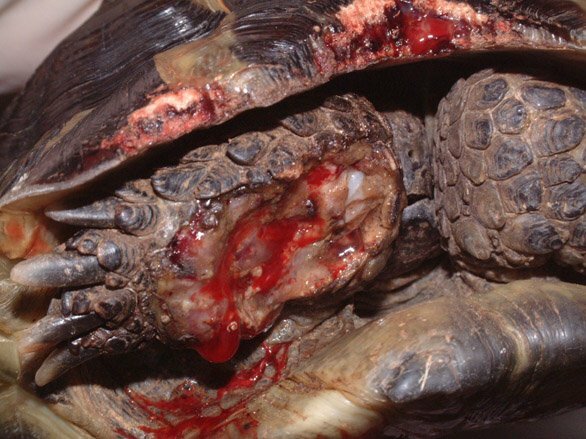 Rat bite injuries are common in hibernated tortoises that are not protected from rat incursion. First aid treatment may involve wound lavage, the application of silver sulfadiazine cream and hydrocolloid dressings, antibiotic therapy and analgesia. Rewarming and fluid therapy are needed in such patients. Placement of an oesophageal feeding tube will allow both fluid and nutritional support. Thorough wound debridement may be necessary under general anaesthesia. Amputation of a severely damaged limb may be required to produce a healthy surgical wound. Prevention of rat incursion is an important consideration when choosing a hibernacula (shelter for hibernation) for a tortoise. A six-year-old, male spur-thighed tortoise (Testudo graeca) was presented in mid-February with rat bite injuries to its limbs, tail and shell. 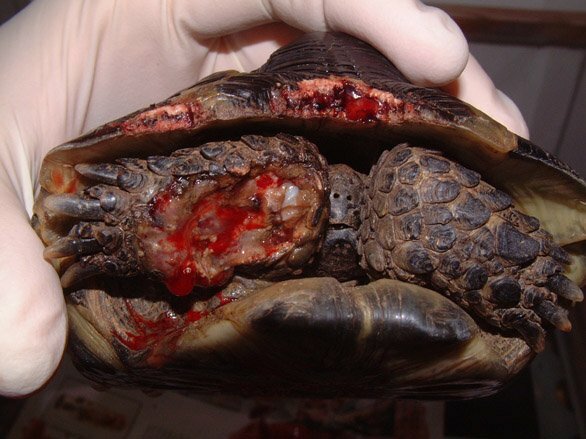 Such injuries are common in hibernated tortoises when no precautions are taken to keep them safe from predation. 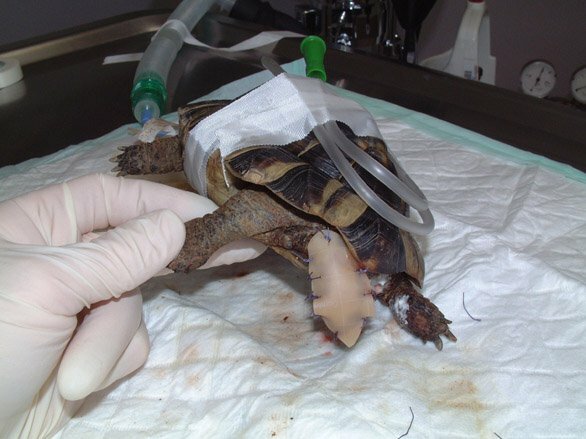 This case report describes the presentation and treatment of the tortoise's injuries. A spur-thighed tortoise was presented in mid-February, having recently emerged from hibernation. 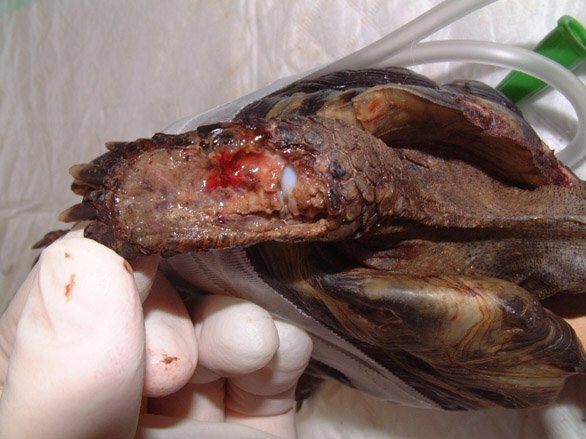 On presentation, the tortoise weighed 510g and was found to have a deep and extensive soft tissue wound to the anterior aspect of the right foreleg (Figure 1). The wound stretched from above the elbow to the level of the carpus and extended down into the elbow joint, as indicated by the presence of synovial fluid within the wound. The wound was contaminated with soil and showed extensive tissue necrosis. Gnaw wounds to the cranial rim of the carapace were noted (Figure 2). A second extensive wound running the length of the tail, from the tip up to the caudal aspect of the left thigh was also noted, together with a smaller wound to the caudal aspect of the right thigh (Figure 3). Initial first aid treatment consisted of wound lavage with dilute povidone iodine. Silver sulfadiazine cream (Flammazine) was applied to all wounds and a hydrocolloid dressing (Comfeel) applied to the right foreleg. Antibiotic treatment was initiated with an intramuscular injection of marbofloxacin (5mg/kg) and a subcutaneous injection of analgesia was also given (meloxicam, 0.2mg/kg). The following day (Day 2), the tortoise was anaesthetised in order to perform a more thorough wound debridement. 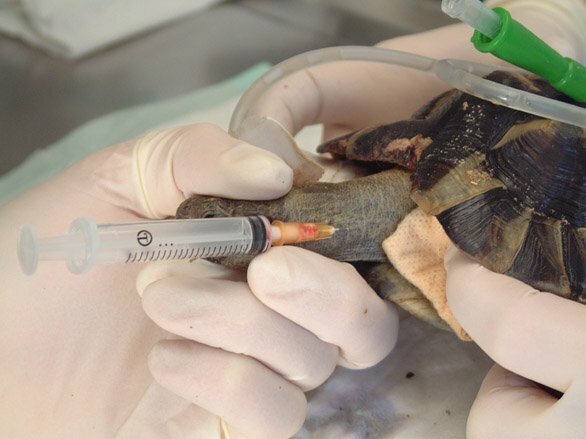 General anaesthesia was induced with propofol (10mg/kg) by intravenous injection; the tortoise was intubated and anaesthesia maintained with isoflurane (1-3%). An oesophageal feeding tube was placed to facilitate supportive feeding, fluid and drug administration. The wounds were again flushed and debrided (Figures 4-6). The tail wound was dressed with a cut section of hydrocolloid dressing (Comfeel), which was sutured in place over the wound (Figures 7 and 8). The wound to the right thigh was similarly cleaned and debrided. The cavity was then packed with silver sulfadiazine cream. Careful assessment of the injuries to the right forelimb confirmed the severity and extensiveness of the tissue necrosis. The owners were advised that the chances of saving the limb were poor and that the speediest recovery would be obtained by limb amputation. Broad spectrum antibiotic cover was continued with intramuscular marbofloxacin (5mg/kg) once a day. Pain relief was also continued with a subcutaneous injection of meloxicam (0.2mg/kg) once daily. The wound to the right forelimb was re-examined on Day 5 and was found to have deteriorated (Figure 9). Consent for the amputation was obtained. 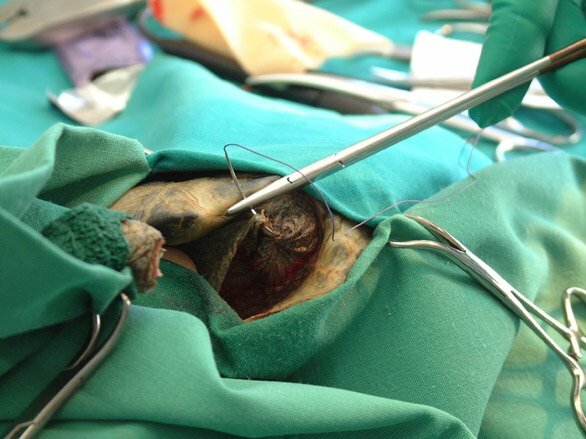 The tortoise was re-anaesthetised on Day 5 and the limb prepared for surgery (Figure 10). A high level amputation was performed through the proximal third of the humerus. The muscle bodies were sutured over the remaining length of humerus and the skin closed with horizontal mattress sutures (Figure 11). The surgical wound was protected with a coat of pulverised aluminium (Aluspray) (Figure 12). Antibiotic cover with marbofloxacin was continued, in combination with a once-daily intramuscular injection of cephalexin (30mg/kg). The tortoise failed to eat voluntarily or produce faeces until Day 8. During this time support feeding was provided via the oesophageal tube, using a mixture of a high fibre herbivore recovery diet (Critical Care) and an electrolyte and probiotic solution (Avipro). A faecal examination on Day 8 revealed no gut parasites. The tortoise was returned to the owners for home care on Day 9. Antibiotic and anti-inflammatory cover were continued for a further ten days. The tortoise was re-presented on Day 15 for a postoperative examination and wound re-dressing. The tortoise was again anesthetised. The surgical wound to the right foreleg was healing well. The tail dressing was removed, revealing a healthy bed of granulation tissue (Figure 13). The tail was re-dressed as previously described (Figure 14). The wound to the right thigh appeared healthy and was cleaned and packed with silver sulfadiazine cream. 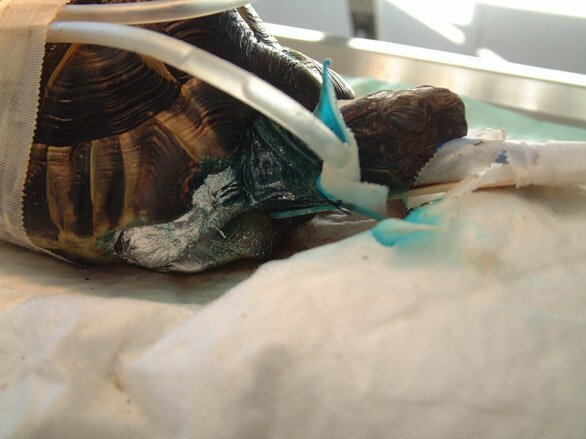 The oesophageal feeding tube was removed as the tortoise was now eating and drinking well. 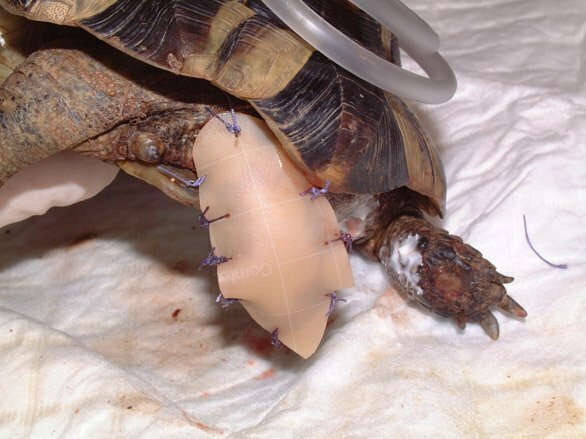 An improvised limb prosthesis was applied to the anterior plastron in the midline to help raise the tortoise's shell off the ground, thus facilitating locomotion. For this purpose, the bowl of a plastic spoon was glued to the plastron with methylmethacrylate (Figure 15). The tortoise was seen again on Day 30. The dressing over the tail was removed. Both the tail wound and the wound to the right thigh were healing well. However, the spoon had raised the shell too far off the floor and was not facilitating locomotion. The improvised limb prosthesis was therefore removed and replaced with a smaller piece of resin. The tortoise was re-examined later in the year. All wounds had healed and the tortoise was doing very well (Figure 16). Rat bites are most commonly reported in reptiles that are fed rats as prey  . Tortoises are, however, also vulnerable to rat attacks, particularly during the winter months when many undergo hibernation. Rat bite trauma is, unfortunately, a common presentation in post-hibernation animals . The exposed surfaces of the fore and hind limbs, as well as the tail, are most commonly affected, although eye and head injuries are also occasionally seen . Gnaw injuries to the shell may also be seen, as in this case  . On presentation, these patients will require a thorough examination and assessment to establish the status of the patient and the extent of their injuries. Initial treatment will aim to stabilise the patient and will consist of fluid therapy, analgesia, rewarming and temporary wound care. Rewarming and fluid therapy are recommended in most patients and, indeed, are necessary to reverse hibernation in patients that have only just emerged from hibernation . Patients should be maintained within their preferred optimal temperature range, which, in Testudo species, is usually between 20 and 32�C. 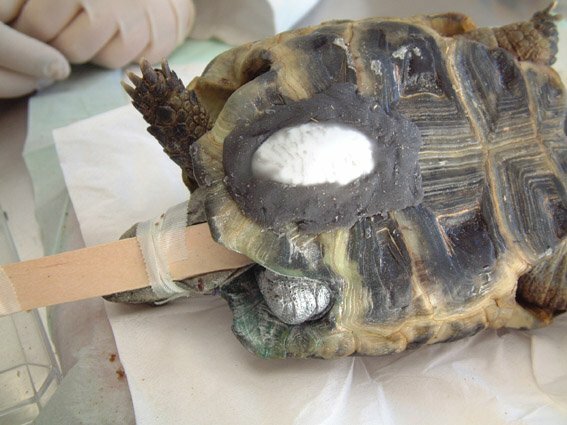 Core body temperature can be monitored using a digital cloacal temperature measuring probe and should be as close as possible to the preferred body temperature (around 26�C for Testudo species). Fluid therapy can be administered either orally or by epicoelomic injection. 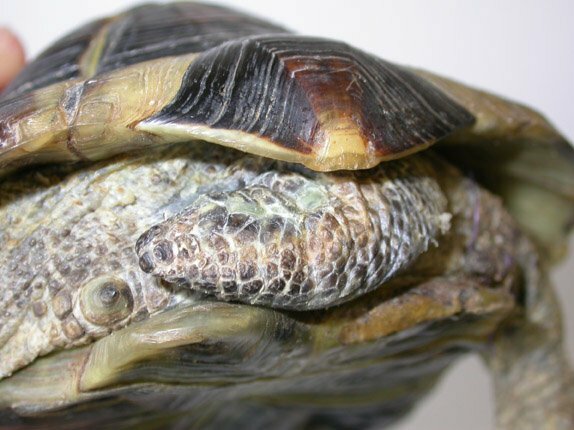 The provision of warm baths will allow fluid uptake via both the oral and cloacal routes, and will encourage the tortoise to void faeces and urine. In the post-hibernation tortoise, the placement of an oesophagostomy tube will allow the provision of both fluid and nutritional support. This can prove particularly useful in tortoises showing post-hibernation anorexia. A high fibre diet, suitable for convalescing herbivores such as rabbits, and mixed with a suitable rehydration formula, can be administered via the oesophagostomy tube. Care should be taken to keep the tube clean and free from blockages. After each feed the tube should be flushed with water and plugged. The provision of antibiotics may need to be delayed until samples have been taken for culture and sensitivity. This step should not be overlooked and, indeed, is strongly recommended because chronic wounds can be infected with a range of bacteria of uncertain antibiotic sensitivity. The possibility of mycotic and/or mycobacterial infection should also be considered. Cytological sample collection may be used to guide initial antibiotic therapy . Initial treatment can be instituted with a cephalosporin antibiotic such as ceftazidime (20mg/kg every 78 hours), which is widely distributed throughout the body , or cephalexin (30mg/kg twice daily). Cephalosporin antibiotics show activity against anaerobes as well as aerobes and this represents a distinct advantage over aminoglycoside and fluoroquinolone antibiotics . Combination therapy using a third-generation cephalosporin together with a fluoroquinolone or an aminoglycoside is reported to be synergistic . Enrofloxacin can be used at 10mg/kg once daily  or marbofloxacin at 5-10mg/kg once daily. In this case, drug availability influenced the selection of antibiotic therapy. Topical therapy using medications such as silver sulfadiazine, dilute chlorhexidine and acriflavine ointment are also proposed . Where further evaluation and characterisation of a contaminated wound is indicated, the combination of a cytologic examination, microbiologic culture and biopsy for histopathology is recommended . Such further tests are indicated in all wounds demonstrating delayed wound healing, as well as in those where neoplasia or nutritional deficiencies are suspected. Analgesia should be provided to counter the pain associated with extensive soft tissue and orthopaedic injuries. McArthur and Hernandez-Divers (2004) recommend the use of the non-steroidal anti-inflammatory drug carprofen, as a single subcutaneous injection at 2-4mg/kg . Concerns over the possibility of reduced renal perfusion in these patients may justify restricting pain relief to a single injection . Opioid partial agonists such as butorphanol and buprenorphine can also be used . In this case, pain relief was provided with meloxicam at 0.2mg/kg once daily. This was continued for a total of 19 days without any obvious side effects. Wound management should be pursued aggressively. All prey bite injuries should be managed as contaminated wounds . Wounds less than six to eight hours old may, however, be suitable for primary closure, in which case care should be taken to evert the skin edges . Older wounds must be assessed carefully. In the first instance, the wounds should be thoroughly flushed and vigorously debrided. This is particularly important as rat bites are potential sources of mycobacteriosis, to which chelonians are known to be susceptible . Wound flushing and debridement should be performed under general anaesthesia. Sedation can be induced using a midazolam and ketamine combination, and anaesthesia achieved by intubating and ventilating with a volatile agent such as isoflurane or sevoflurane . Alternatively, anaesthesia can be induced using propofol at 10-14mg/kg, as described here. Surgical debridement of all necrotic and non-viable tissue should be performed at the earliest opportunity and repeated until healthy tissue margins are established. Severely affected limbs should be immobilised. This can be achieved by flexing the limb, folding it back into the shell and taping across the opening between the plastron and carapace. Extensive injuries to the limbs may warrant surgical amputation in order to produce a healthy surgical wound, as occurred in this case. Open wounds should be protected against dessication and secondary infection. Such wounds may be protected with a gel suited to open wound management and covered with a moisture vapour permeable dressing. Alternatively, they can be dressed with a hydrocolloid dressing that can be secured over the wound with simple interrupted sutures. Such dressings ensure that the wound is kept clean and moist, creating an optimal environment for wound healing. These dressings appear to be well tolerated and resistant to the daily wetting that occurs when the tortoise is bathed. It is important that baths are kept short (approximately five minutes) in order to minimise exposure to water and any excreta produced by the tortoise. Where additional debridement is required, some authors propose the use of wet to dry bandages consisting of surgical gauze soaked in physiological saline or a 1:40 solution of warmed chlorhexidine . The frequency of dressing changes will be dictated by the extent of any wound discharge. Dressings on granulating wounds producing minimal wound discharge can be changed every four to seven days. In chelonians, the skin structure has evolved to resist the aggressive challenges of a range of hostile environments. Their natural environment is typically hot, arid and abrasive and the tortoise's skin therefore needs to be resistant to mechanical trauma, heat and intense ultraviolet radiation. The skin that covers the tail, head, neck and limbs is, in places, heavily keratinised and protected by scales of ectodermal origin  . The reptilian epidermis is composed of three main layers; the beta-keratin layer is the most superficial layer and overlies the mesos layer and the alpha-keratin layer . The alpha-keratin layer is supported by the underlying stratum germinativum. The epithelium that overlies the chelonian shell is generally thickest and contains layers of keratin overlying a pseudostratified layer . The deeper dermis is derived from embryonic mesoderm and provides support, nourishment and colour to the epidermis . The dermis contains connective tissue, vascular tissues, sensory structures and dermal bone (osteoderms). Osteroderms are composed of a mixture of spongy and compact bone and, in tortoises, have fused with the ribcage and spine, expanding to form the plates of bone that make up the chelonian carapace and plastron . 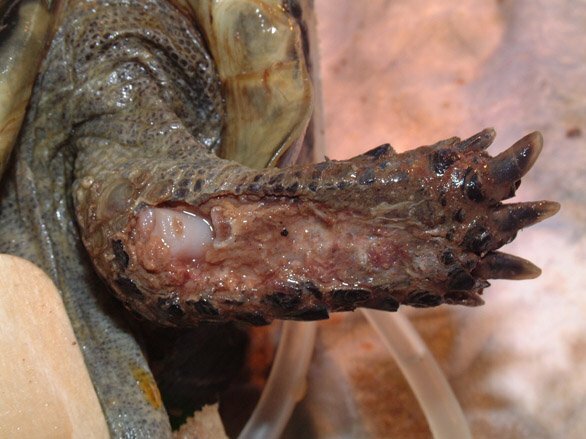 Wound healing in tortoises proceeds by a process of granulation, epithelialisation and wound contraction. The process of wound healing in reptiles is further described by Bennet and Mader (1996)  and Mitchell and Diaz-Figueroa (2004) . Skin wounds generally take several weeks to heal and the process has been shown to be temperature dependent  . The choice of hibernacula should take into account the possibility of rat incursion. Insulated boxes have, historically, been popular with UK tortoise keepers but leave the potential for rat trauma. Many authors now prefer to use refrigerators as a hibernation enclosure. These are eminently suitable for the purpose of hibernating a number of tortoises, provided that air is changed on a daily basis and the temperature closely monitored. Whatever the method of hibernation, the container and building should be made rat proof. Regular checks should be made, particularly where insulated boxes are placed in lofts or garages. In addition to visual checks, tortoises should be weighed during their hibernation and the ambient temperature carefully monitored to ensure that it remains within the range 2 to 9�C. Weight loss during hibernation should not exceed 8 to 10% body weight. 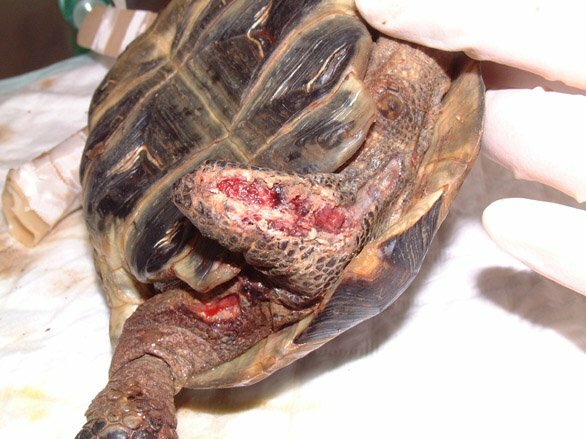 Rat bite injuries are commonly sustained by hibernating tortoises. 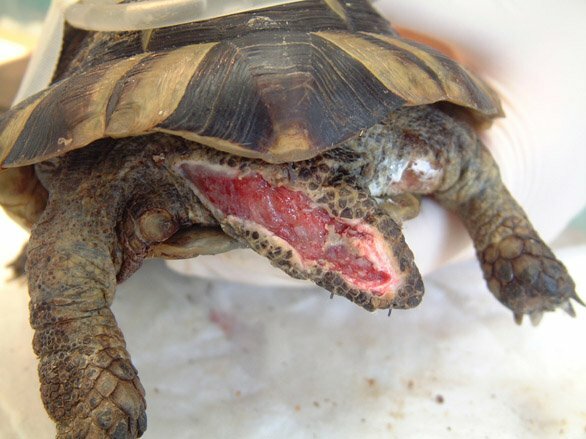 Such injuries are therefore commonly seen in post-hibernation tortoises. Soft tissue injuries are typically sustained to the tail, fore and hind limbs, although the head and neck may also be involved. Our understanding of wound healing in reptiles is still in its infancy and, to date, many of the therapeutic methods used in reptiles have been adopted from those in use in human, mammalian or avian species. Aggressive wound management techniques are indicated and can often involve limb amputation. Even very extensive soft tissue wounds can respond well to treatment. 1. Barten SL. Bites from prey. In: Mader DR, editor. Reptile Medicine and Surgery. St Louis, MO: Elsevier, 2006; 747-50. 2. Schilliger L. Morsures. In: Schilliger L, editor. Guide Pratique des Maladies des Reptiles en Captivit�. Paris: Editions Med'Com, 2004; 122-3. 3. McArthur S, Hernandez-Divers S. Surgery. In: McArthur S, Wilkinson R, Meyer J, editors. 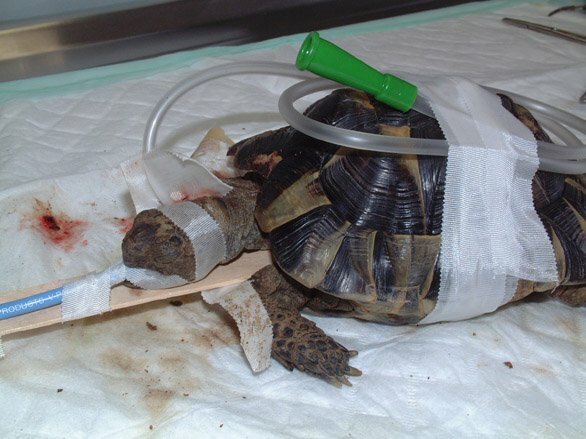 Medicine and Surgery of Tortoises and Turtles. Oxford: Blackwell Publishing, 2004; 403-64. 4. Barten SL. Shell damage. In: Mader DR, editor. Reptile Medicine and Surgery. St Louis, MO: Elsevier, 2006; 893-9. 5. Schilliger L. Fractures de la carapace. In: Schilliger L, editor. Guide Pratique des Maladies des Reptiles en Captivit�. Paris: Editions Med'Com, 2004; 78-80. 6. Mitchell MA, Diaz-Figueroa O. Wound management in reptiles. Vet Clin North Am Exot Anim Pract 2004; 7(1): 123-40. 7. Mayer I, Nagy E. Investigation of the synergic effects of aminoglycoside-fluoroquinolone and third-generation cephalosporin combinations against clinical isolates of Pseudomonas spp. J Antimicrob Chemother 1999; 43(5): 651-7. 8. Raphael B, Papich B, Cook RA. Pharmacokinetics of enrofloxacin after a single intramuscular injection of enrofloxacin in Indian Star Tortoises. J Zoo Wildlife Med 1994; 25: 88-94. 9. Fraser MA, Girling SJ. Dermatology. In: Girling SJ, Raiti P, editors. BSAVA Manual of Reptiles. Second edition. Gloucester: British Small Animal Veterinary Association, 2004; 184-98. 10. Cooper JE. Integument. In: Beynon PH, Lawton MPC, Cooper JE, editors. BSAVA Manual of Reptiles. Cheltenham: British Small Animal Veterinary Association, 1992; 73-9. 11. Davies PMC. Anatomy and physiology. In: Cooper JE, Jackson OF, editors. Diseases of the Reptilia. London: Academic Press, 1981. 12. Bennett RA, Mader DR. Soft tissue surgery. In: Mader DR, editor. Reptile Medicine and Surgery. St Louis, MO: Elsevier, 1996; 287-98. 13. Smith DA, Barker IK, Allen OB. The effect of ambient temperature and type of wound on healing of cutaneous wounds in the common garter snake (Thamnophis sirtalis). Can J Vet Res 1988; 52(1): 120-8.